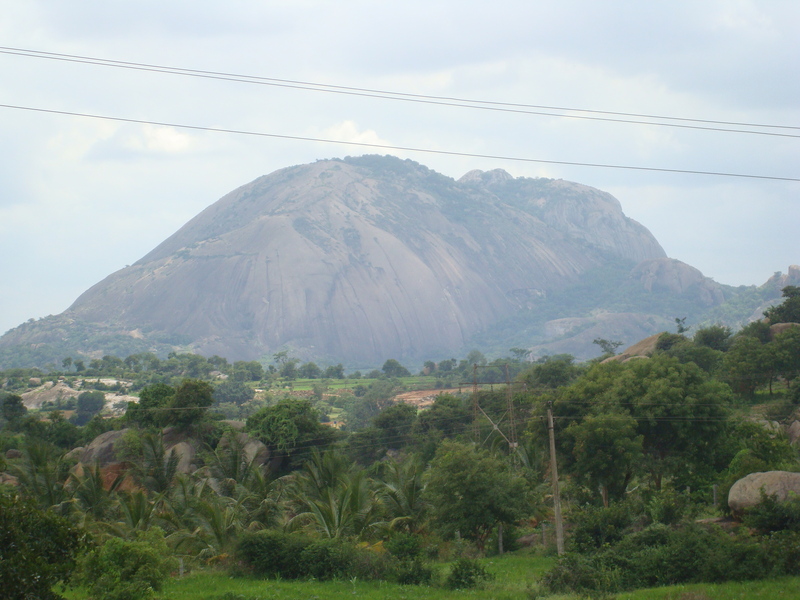 Sawandurga as seen from ~10 kms away. We met after a long time accidentally at the cafeteria. Over coffee we exchanged pleasantries and soon discovered that we were free on 2nd October. Back in the grad school days we had done a number of treks together so we decided we would relive those days by going on a one day trek. We would start early and be back by evening. 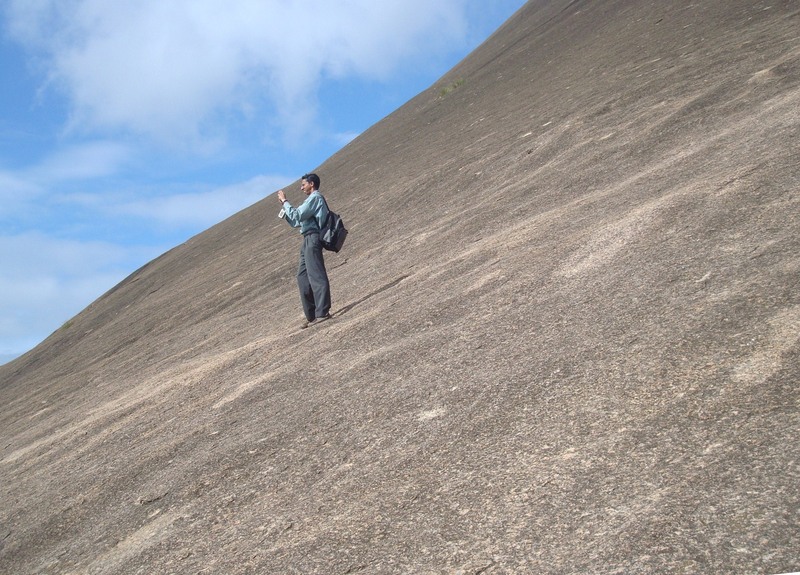 There are a number of trekking places near Bangalore but we quickly narrowed down to Sawandurga. 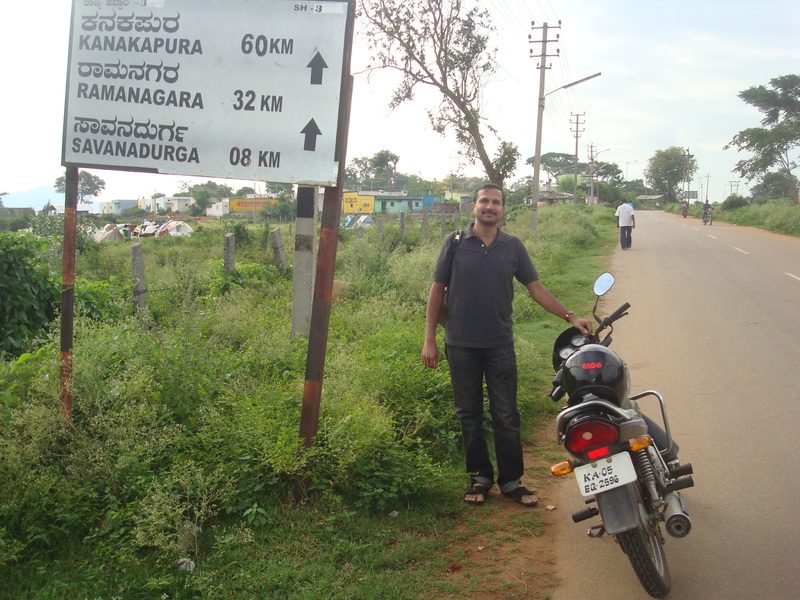 It is 60 Km from Bangalore and we had been there 10-12 years ago. I couldn’t remember the details but I discovered that he had almost a photographic memory-he remembers that 11 of us had been there and also the names! We thought we would take the bus like we had years ago. We had taken the bus from Majestic but his memory said that it was from K.R. market. A little Google search revealed that bus no. 241 M shuttled from K.R. Market to Sawandurga. But there was no information about the timings or frequency. So, I suggested that we drive on my motorbyke instead. He remembered the route: go to Magadi and then take the diversion to Sawandurga. He even knew how we would go to Magadi: go to Malleshwaram take the diversion at 17th Cross to Rajajinagar-West of Chord Road and the right right turn to Magadi road. That was good enough for me, after all I knew how to go to Malleshwaram. I lived there once! Soon after Magadi town when we got off the main road we saw this sign board. This was the first board mentioning Sawandurga. We started at 6:45 a.m. on the Hero Honda Passion. We stopped at Adigas fast food restaurant on Magadi Road and had Breakfast (Idlis and Coffee) . On the way, soon after we put the city behind, when the road went up hill we saw a mountain in the not so distant far. Could that be Sawandurga ? We thought we will check it on the way back from mountain. This we did by driving a little and looking back to spot the mountain. We traced it for a little while but the shape of the mountain changed the farther we drove and soon we were not sure if we were looking at the same mountain. So, that remains a mystery. After we crossed Magadi town we kept an eye for the direction board. Soon enough we came at a T junction flanked on each side by tea stalls and people. We asked if it was the right turn to Sawandurga. Yes it was. I noticed just then hidden behind foliage and people smoking, Sawandurga, written in Kannada, on a wall with an arrow pointing towards the road. We took the turn and a few yards ahead we crossed the direction board that we were hoping to see. I thought it would be good to take a picture and that is the one shown here. 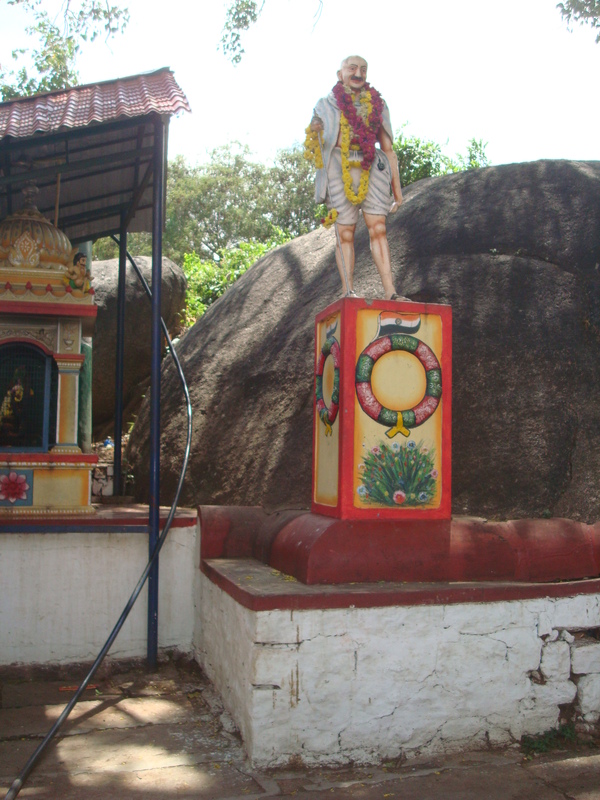 The Narasimha Temple at the base of the hill. 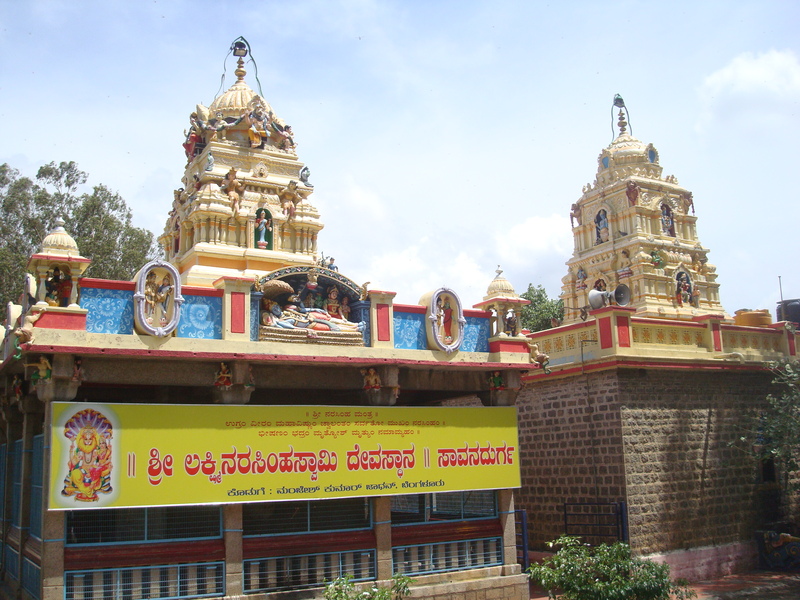 were in Sawandurga. They say it’s the largest monolith in Asia. It does look gigantic but largest in Asia? I doubt that. At the base there is a Narasimha temple, a couple of shops and vendors selling flowers, fruits, coconuts etc. for ritualistic worship. We did not see any bykes parked around – 9 a.m. is probably a bit early to expect bikers. With no parking place per se we asked a shopkeeper if we could keep the byke by her shop and if she could keep the helmet with her until we were back. She agreed. I bought the mango drink, Slice and we started the trek. The fort wall seen at the top of the picture. There is no direction indicating the way to the hill so we just went along a narrow path way that went towards the hill. A family with kids was already on the way up. 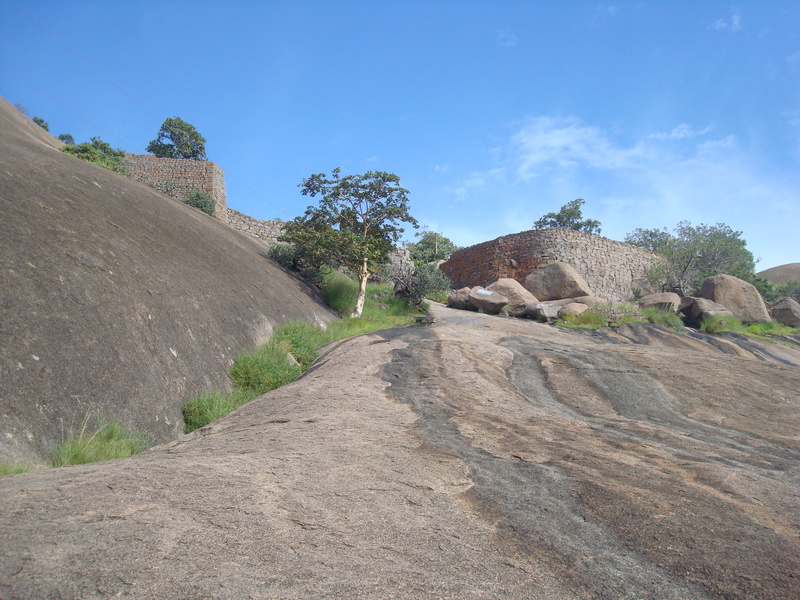 Sawandurga is a durga (fort) and this is indicated by ruins of the fort wall here and there around the hill. There is also a shelter intact on the hill. 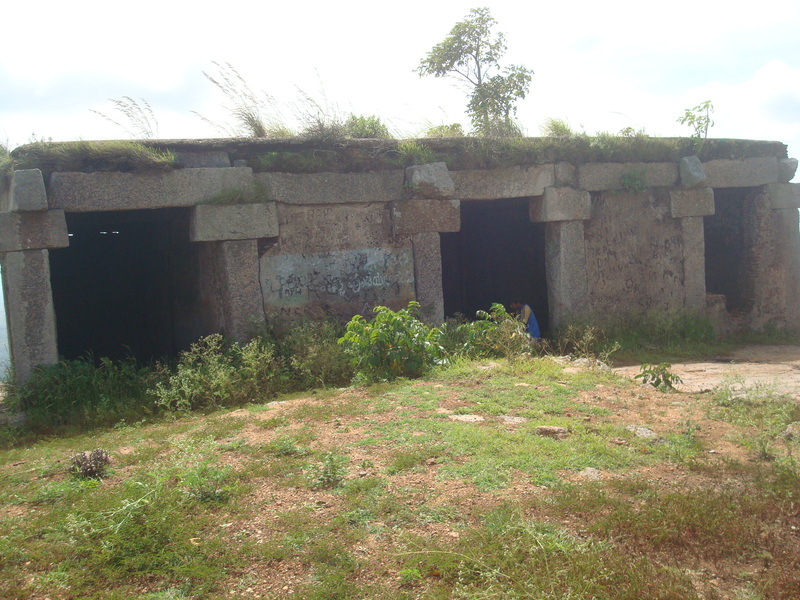 Typically, the families with kids go up to the fort wall that can be seen on one side of the hill. There are no steps and the rock is steep and in some patches slippery because of rain water streamlets (as in the picture). If one avoids the watery parts the rock has just right amount roughness to give a good grip for any one to walk up! Some women even walked up in daily use sandals! A sports sandal is more than enough to give a grip. Shelter on way up the mountain. The other face of the hill is steeper, nearly 60 degrees incline, and is strictly for those who have some experience and confidence. I climbed that way ten years ago but was not sure now. I took the easier route and went up to the fort wall. There i waited for my friend join me. He tried the steeper route for a while and then changed his mind. After the fort wall there are arrows marked along the rock indicating the easier way up hill. That was really helpful. At times one is tempted to go up a seemingly shorter way only to find that it ends up in a dead end. There are valleys in the rock (a U shape rock) that cannot be noticed from afar. As in life here too there are no short cuts! My suggestion, if you are a casual trekker follow the arrows. The arrows follow a relatively flat terrain and then comes the real climb. This steep enough to scare but doable. Grooves just about enough to rest a shoe are carved in to the rock towards the top end where it is steeper. Once we reach this end its an easy walk up hill. We walked on the fort wall that was nearly flattened to the level of the rock. Soon we came across the shelter that must have been used for storage or possibly horses in the olden days. A little further we spotted the peak of the hill marked by a whitish construction. 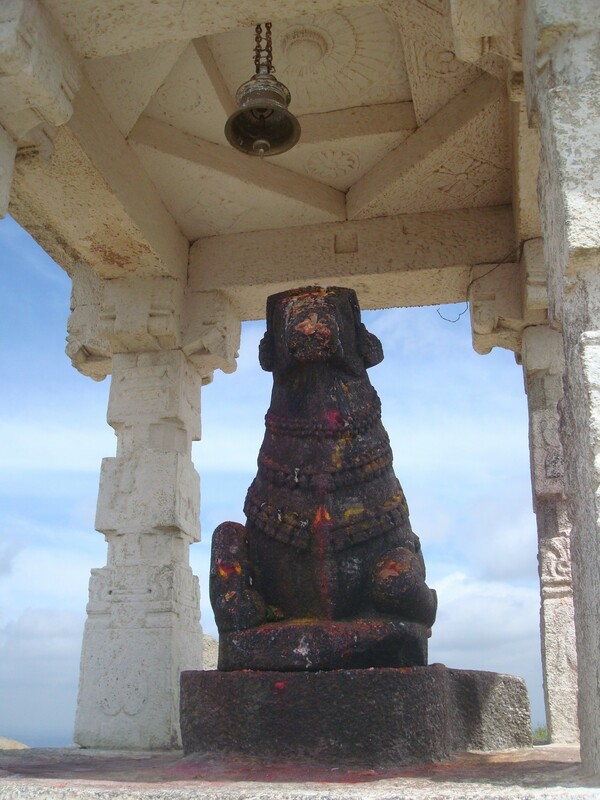 A mini-temple for the Bull, Nandi at the peak. A statue of Mahatma Gandhi in the temple courtyard! It was a coincidence of sorts because it was Gandhi Jayanti today. quickly recovered his balance with only a scratch on his palm. At the base we found it was now crowded, there were lots of bikes, two buses and more vendors. We had tender coconut and started on our way back to Bangalore at 1:30 p.m. One and half hours later we were in Adiga’s restaurant having late lunch. 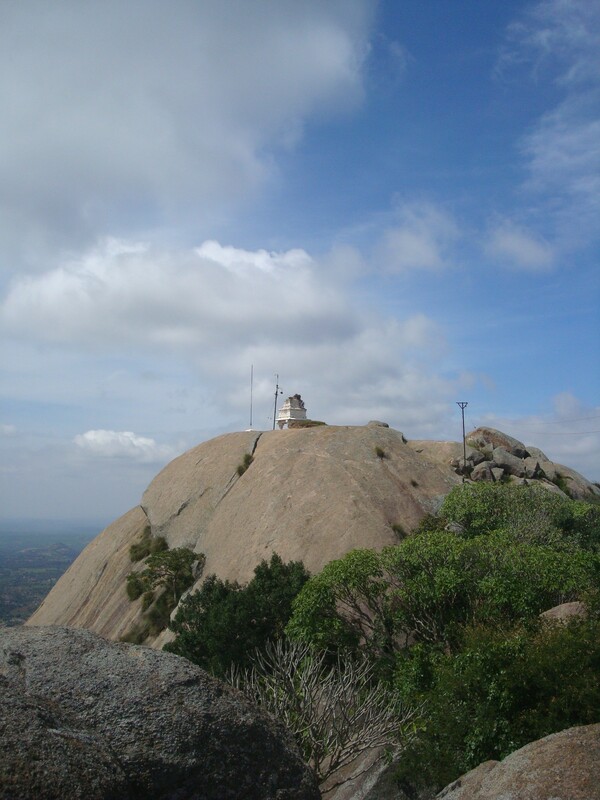 This entry was posted on October 8, 2012 at 7:08 pm and is filed under Bangalore treks. You can follow any responses to this entry through the RSS 2.0 feed. You can leave a response, or trackback from your own site.